The new 10K Series Muffin Monster® from JWC Environmental combines superior waste grinding capabilities in a compact, easy-to-install unit that’s perfectly suited to a variety of wastewater grinding applications. This newest addition to the hard-working family of Muffin Monster grinders is available in pipeline, open channel and pump station configurations that pack big power in a small package. 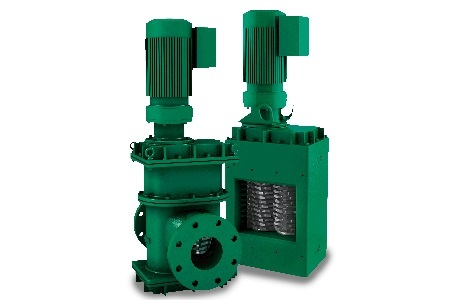 The 10K in-line Muffin Monster is ideally suited for protecting sludge pumps, sentive centrifuges, samplers or heat exchangers in resource recovery facilities. The 2 or 3 hp (1.5 or 2.2 kW) motors provide all the cutting force required to shred tough solids. Its efficient dual-shafted grinding technology will not get clogged by wipes or other non-dispersables as is common with high speed macerators. For added versatility and performance, the 10K Series units are available with 7-, 11- or 13-tooth cutter combinations to fit individual customer applications. Since its founding in 1973, JWC Environmental has become a world leader in solids reduction and removal for the wastewater industry with its Muffin Monster grinders and Monster screening, compaction and washing systems. JWC also solves challenging size reduction and processing problems in commercial and industrial applications through its Monster Industrial division. JWC Environmental is headquartered in Costa Mesa, California and has a global network of representatives, distributors and regional service centers to provide customer support. For more information, visit JWC Environmental at www.jwce.com.